If anyone has notions the Chicago Blues are waving goodbye they need to check with Rob Stone. Gotta Keep Rollin, Rob’s newest album will dispel any such rumors. Accompanying Rob are Chris James, Patrick Rynn, and Willie Hayes offering a sound rich in traditional Chicago Blues. Providing a finishing touch, David Maxwell, Eddie Shaw, and John Primer sat in on this undertaking, with the great Henry Gray performing his keyboard mastery as well. Rob’s music on Gotta Keep Rollin is sublime from his singer/songwriter abilities to his wicked harp. He is no novice as he goes back to the days performing with Sam Lay. Influenced by harp players Charlie Musselwhite, Jerry Portnoy, as well as earlier impacts such as Big Walter Horton and Junior Wells, Rob and his harmonica are noteworthy. Gotta Keep Rollin denotes a progressive sound with the band’s own material while maintaining traditional sounds of artists like Willie McTell, Jazz Gillium and more. Essentially, Gotta Keep Rollin is a legendary album of old with new. The album opens covering Johnny Jones’, “Wait Baby.” Rob’s harp is distinct as it replaces the sax on Jones’ version. The band stays true to the original, but the added harmonica completes the piece. It’s an awesome beginning that sets a pervading tone in the album. Rob’s harmonica is superb as the band recreates the Chicago Blues in “Lucky 13.” In “She Belongs to Me,” Rob covers this piece close to the original, and sounds as if he is paying tribute to Jazz Gillium. As the band shifts into the instrumental, “Strollin with Sasquatch,” Rob’s harmonica is the “front man.” David Maxwell on piano is phenomenal. This is a number Charlie Musselwhite would tip his hat to. The number comes off as an impromptu jam session as “Strollin with Sasquatch” is flawless. In addition, I have to mention “Move Baby Move” as a favorite with the rockabilly blues sound of Billy “The Kid” Emerson. Willie McTell’s “Cold Winter Day” is another top pick covered as Blind Willie took the blues from Statesboro to Chicago. David Maxwell is again awesome in the number with a “honky-tonk” technique. The album finishes with the fast pace blues/rockabilly fusion, “Not No Mo” written by Rob, Chris James, and Patrick Rynn. I love the guitars reminiscent of the 50s Texas Blues. The track is an astounding finish. With years making music together, this band is extremely tight, playing as one. Rob’s music will draw blues lovers into this album. This is Rob’s fourth album as a bandleader as he shows his preeminence of the Chicago Blues. Gotta Keep Rollin plays to the purist, and is a must for Chicago Blues enthusiasts. It’s an album that taps into older originals, but adds a contemporary sense from new material. With many great blues artists on the album, Gotta Keep Rollin is staggering. The problem Rob will have is producing an album superior to Gotta Keep Rollin. 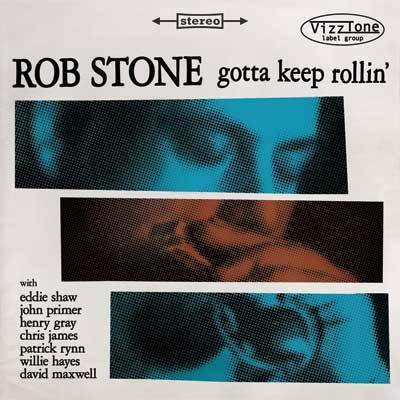 This is Rob Stone, and he’s Gotta Keep Rollin.